The 2017 Chrysler Pacifica, which uses steel, aluminum, magnesium and composites in its body-in-white and closures, just became the first minivan to earn the IIHS’ highest safety award under the tougher 2016 criteria. At the Center for Automotive Research’s Management Briefing Sessions and NACE in August, we had a chance to learn more about the innovative vehicle, the new and renamed version of the Town & Country. 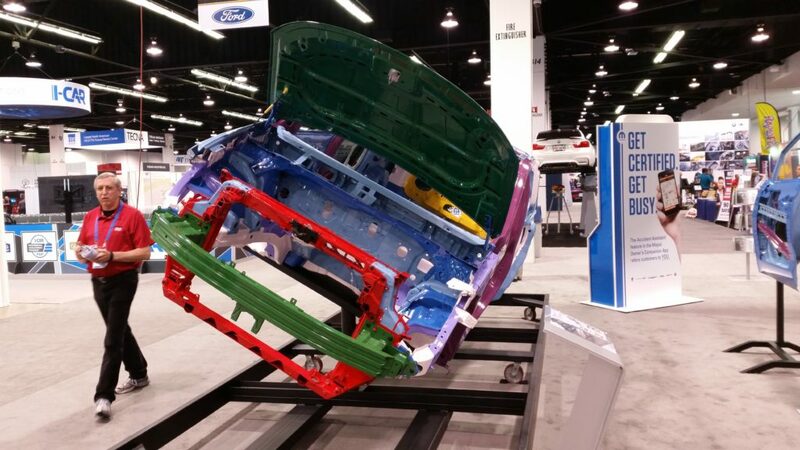 Body shops will want to do the same — FCA might be throwing a lot of new materials at you here, and there are potentially up to 8 passengers whose lives depend on preserving that crashworthiness. You’re quite likely to see one; FCA sold more than 90,000 of the old T&C in 2015, and it’s sold 35,572 of the next-generation parentmobile since it went on sale in April. 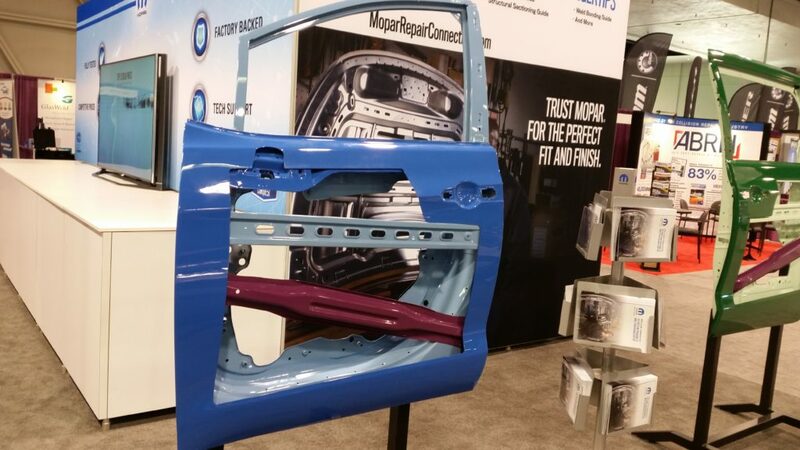 Get the body repair manual free now and find other repair details on the Mopar Repair Connection site. 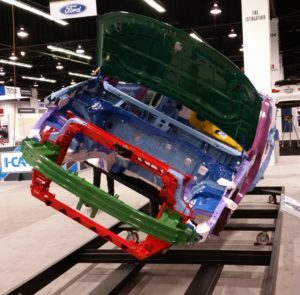 Though an earlier version of the Pacifica flunked the small-overlap test by having part of the door torn off its hinges, anything built September 2016 or later — check the certification label if you’re buying one — has a stronger upper door hinge and joint between the door hinge pillar and inner body panel in front of the pillar. Those changes led the minivan to earn the top “good” small-overlap rating, and combined with other results, the Top Safety Pick+. Mike Downey, director of Chrysler body engineering, presented the Pacifica at the CAR sessions Aug. 1, giving us and his OEM peers a better look inside the minivan. Engineering wasn’t easy, he said, and the giant sunroof and stow-and-go seating hole in the floor complicated the task. 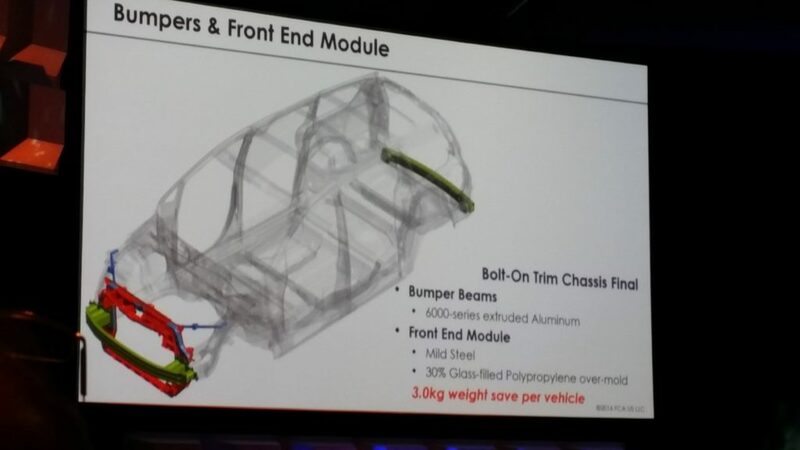 The front end also ought to interest shops because of its extruded aluminum bumper beam (the rear bumper is also aluminum) and a front-end module of mild steel and a glass-filled composite mold. And then there’s the matter of picking materials to save weight and yield fuel economy while keeping everyone safe. The minivan is 250 pounds lighter than the 2016 Town & Country, and 72 percent of the Pacifica is high-strength or stronger steel. 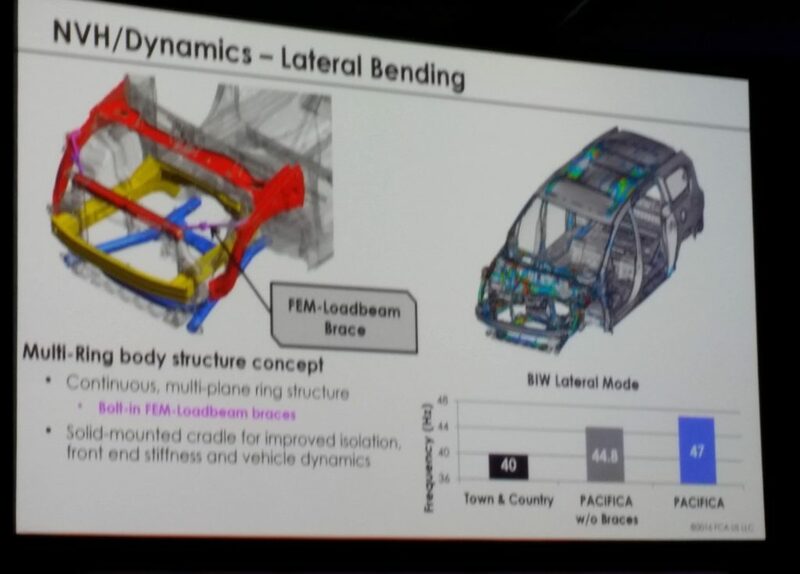 Using so much high-strength steel created some manufacturing constraints in terms of load paths, joints, sections and materials, and Downey said FCA spent a lot of time analyzing the minivan’s joints — even bead locations could gain strength. 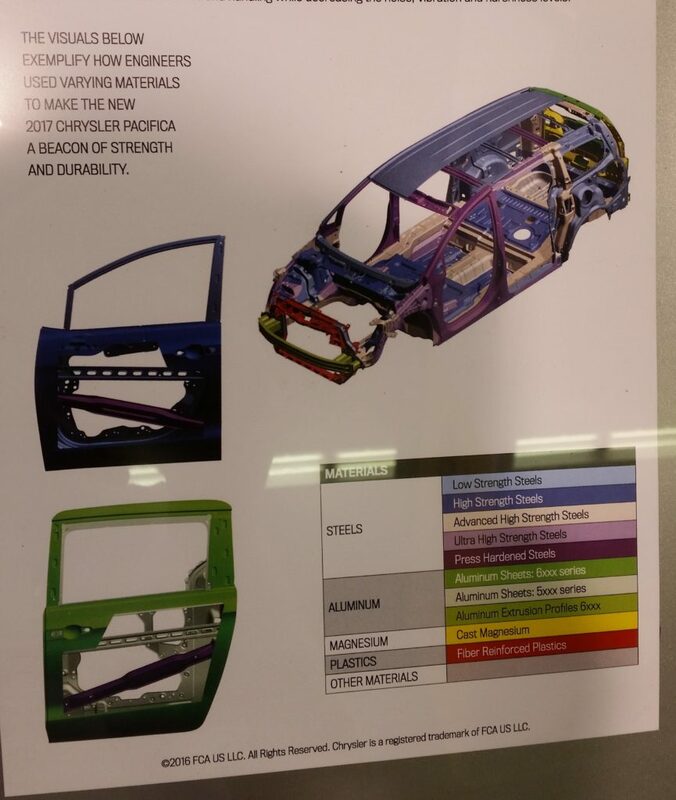 By looking at loadpaths, FCA knew “that’s where we need the strong material,” he said. 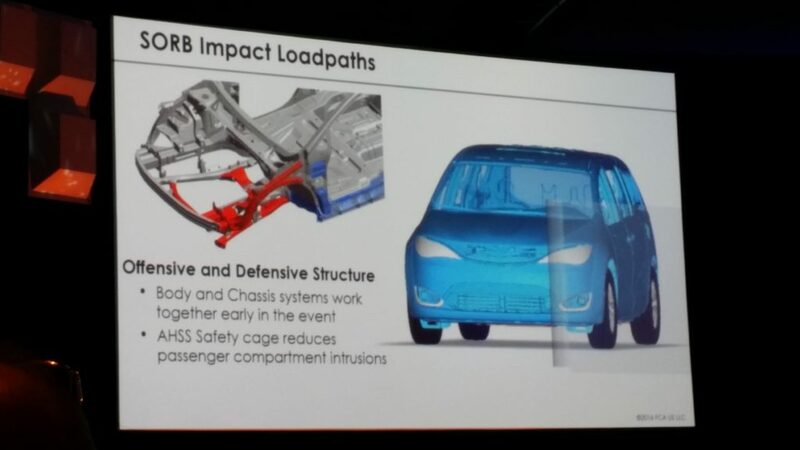 In that way, the company could optimize the structure itself; as Downey noted, a gigantic crossmember in the middle of the minivan was useless if unnecessary for crash load. “There is no perfect material” for each application, Downey observed. Some areas didn’t need high-strength steels. 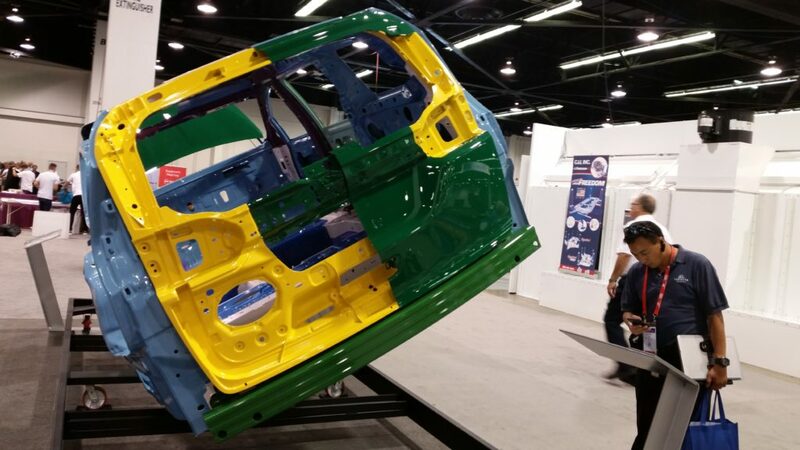 Others required Chrysler to use the Pacifica’s top ultra-high-strength-steel tensile strength of 980 megapascals. He said a driver could “really feel” the torsion improvement from the stronger materials FCA used. The OEM even mixed materials between doors. The sliding doors on the minivan are aluminum with an ultra-high-strength steel reinforcement, while the regular front doors are high-strength and mild steel with ultra-high-strength steel reinforcement. 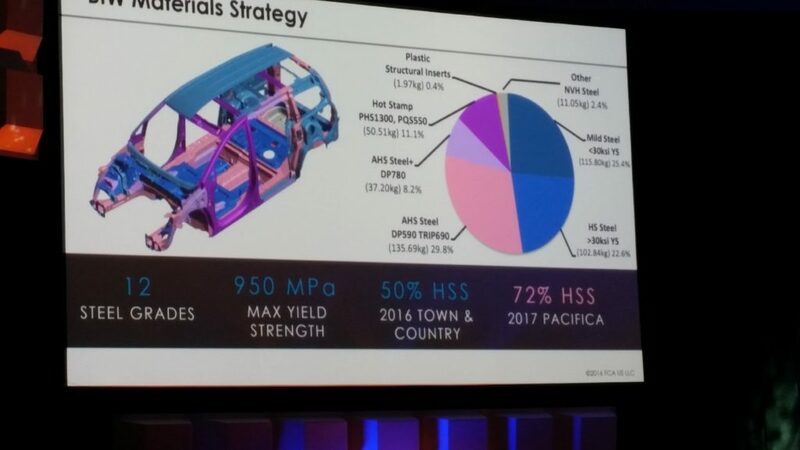 Asked about the future, Downey noted that the materials technology continues to advance; in fact, some of what appear to be revolutionary Pacifica design decisions were actually made years ago, according to Downey. FCA would continue to examine Generation 3 high-strength, high-formability steel, as well as aluminum and magnesium, he said. Downey talked about how using a stronger, lighter material can have other benefits. 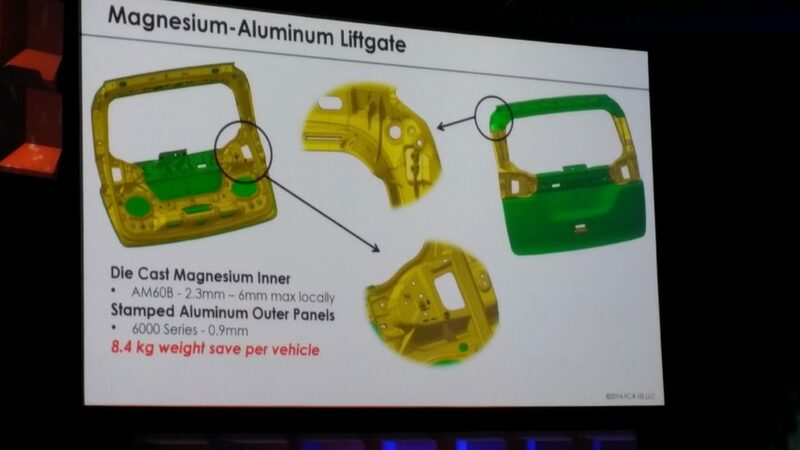 For example, the cast magnesium inner on the Pacifica liftgate didn’t need certain reinforcements welded to it. 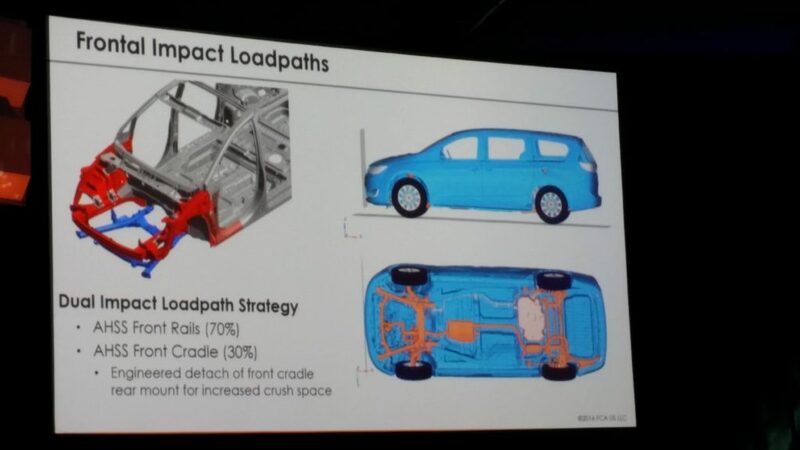 Lower weight meant the motors for the power liftgate could become smaller as well. 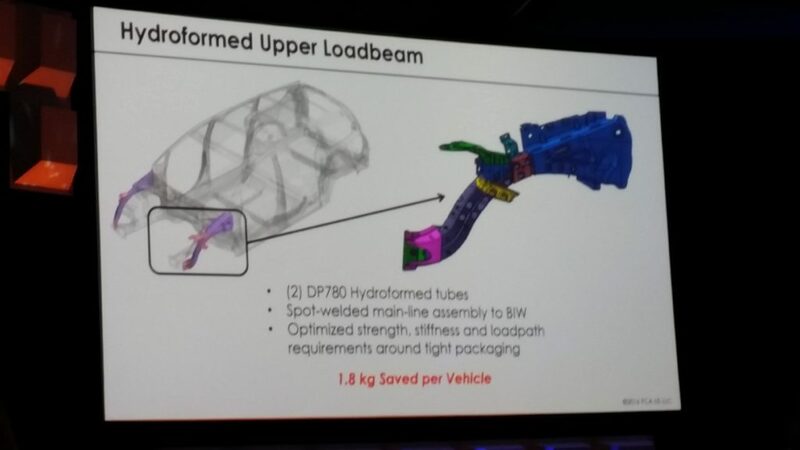 “Weight savings begets weight savings as well,” he said. Asked if the Pacifica would become a shared platform, Downey said he couldn’t discuss future plans. The Pacifica also won its Top Safety Pick+ title with its advanced driver assistance systems, such as autobraking. Every possible ADAS short of a Google Car brain is available on the Pacifica, including abilities like self-parking, adaptive cruise control and lane-keeping. Downey said this technology really didn’t add much weight to the minivan. Downey also was kind enough to give us a tour of the Pacifica’s various possible sensors and cameras; take a look with the video below.